Who gets the most corporate welfare — a.k.a. government freebies to for-profit companies — comes down to which companies do the most political spending on campaign donations and lobbying in Washington. And it turns out those companies spending big bucks investing in Washington see huge rewards. That's all at the expense of the American taxpayer… but we'll get to that next. In 2014, the Sunlight Foundation, a non-partisan nonprofit a group that wants government transparency, conducted a study of political spending over the 2007 to 2012 period. It looked at the lobbying expenditures and campaign donations of the 200 companies most politically active in the United States- and in particular, what each got in return. Results showed the political spending of the 200 companies it identified was about $5.8 billion over the six years. In return, those companies got an astounding $4.4 trillion in corporate welfare. Put another way, every dollar of political spending generated a return on investment of $760 for these private companies. That's a gain of 76,000% over just six years. These figures may seem incredulous, but changes in government policy can have a tremendous impact on a company's profits. Companies that land government contracts are doing business with the most lucrative client in the world. And because the period of the study encompassed the 2008 financial crisis, generous bailouts also were part of the mix. "As middle-class Americans lost ground, the 'Fixed Fortune 200' got what they needed. What they needed included loans that helped automakers and banks survive the recent recession while many homeowners went under," the Sunlight Foundation study said. "It included budget busting emergency measures that funneled extra dollars to everything from defense contractors to public utility companies to financial industry giants." Over the six-year period, the 200 companies in the study won a third of the money doled out in $3 billion worth of government contracts. And they got 73% of the $410 billion distributed under the Troubled Asset Relief Program (TARP). The Sunlight Foundation study also found that the corporate welfare firehose flowed just as generously when Democrats were in power as it did when Republicans were in power. Likewise, the political spending favored neither party, as the companies are less interested in influencing who gets elected than having influence over the winners. 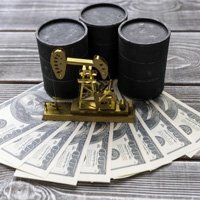 The 200 companies in the study include most major industries, including energy, banking, technology, healthcare, entertainment, and consumer goods. Many are household names, such as Microsoft Corp. (Nasdaq: MSFT), Verizon Communications Inc. (NYSE: VZ), McDonald's Corp. (NYSE: MCD), United Parcel Service Inc. (NYSE: UPS), and Wal-Mart Stores Inc. (NYSE: WMT). And several of these iconic companies received king-sized amounts of corporate welfare, much more than the average for the 200 in the study. But here's the real kicker: Over the same period in the Foundation's study (2007 to 2012), individual taxpayers contributed $6.5 trillion to the U.S. Treasury. That means this corporate welfare swallowed up about two-thirds of that. You see, the bulk of the hundreds of billions of dollars bestowed on these mega-corporations comes from the taxes drawn from the average working American. Remember, the average return on political spending for all of the 200 companies in the Sunlight Foundation study was 76,000%. Some got much less. And some got much more. 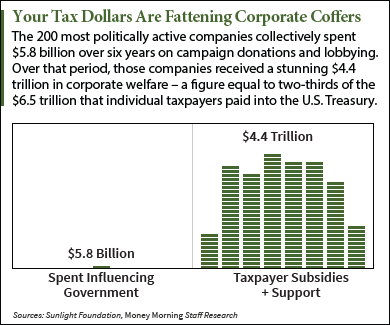 The Sunlight Foundation said 29 companies received corporate welfare in amounts 1,000 times or more what they invested in Washington (returns in excess of 100,000%). Some names you'd expect to see. General Motors Co. (NYSE: GM) received a lot of government help following its bankruptcy during the financial crisis. GM received $70 billion in government support – a sweet 107,033% return on its investment of $65.4 million. Defense contractors also fared well. Lockheed Martin Corp. (NYSE: LMT) got over $204 billion in benefits from the government after having invested $92.7 million over the six-year period. That's a return of 220,388%. And then there's the Big Banks – the "too big to fail" banks. You know, the folks who created the 2008 financial crisis. They got the biggest returns of all. Goldman Sachs Group Inc. (NYSE: GS) invested $38 million and got $229.4 billion, a return of 603,684%. JPMorgan Chase & Co. (NYSE: JPM) invested $52.1 million and received benefits worth $473.6 billion, a return of 909,021%. And Citigroup Inc. (NYSE: C) invested $44.2 million and was rewarded with benefits worth $505.8 billion, a return of 1,144,343%. The federal government's largesse isn't restricted to U.S.-based companies, either. Foreign companies, including foreign banks, are also welcome. Credit Suisse Group AG (NYSE ADR: CS) got $225.1 billion, and UBS Group AG (NYSE: UBS) got $249.1 billion. But perhaps the most galling is the $328.2 billion in benefits given to Deutsche Bank AG (NYSE: DB). Yes, the same European bank that's teetering on the edge of collapse right now, the same bank from which the United States is seeking a $14 billion fine for selling risky mortgage-backed securities prior to the financial crisis. Because Deutsche Bank's political spending totaled just $9.7 million in Washington, its return on investment was a stratospheric 3,383,505%.